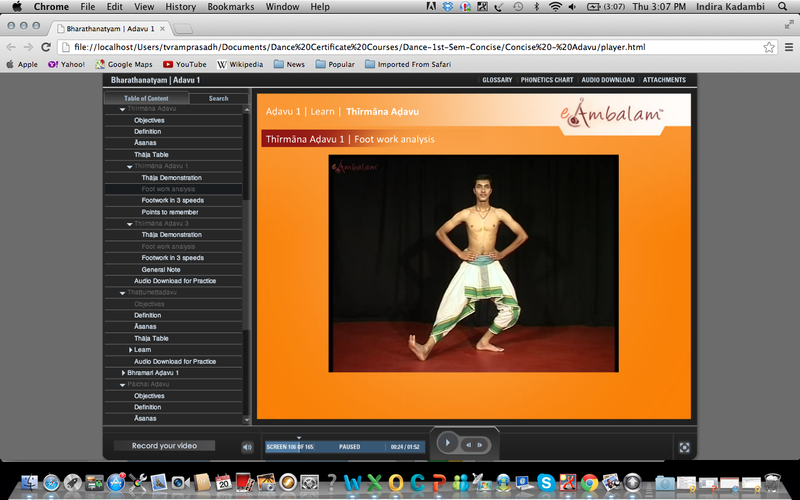 eAmbalam’s Online College of Music, Dance and Yoga, the world’s first online college of Indian classical music and dance with yoga said one listing on an internet search engine. When one types the phrase ‘Online Bharatanatyam classes’ into a search engine on the internet, it throws up some options and one wonders whether do people actually teach Indian classical dance online and how many learn? People think it is impossible to learn dance online. There were few sites where only videos were uploaded. But here, I found one which showcased of online courses on dance with a very structured curriculum, teacher interaction etc. This only made me curious to explore how this could satiate my long term passion of learning dance. Being a working woman, there are limitations to how much time I can devote to classes and the long hours and geographical constraints make it even more an impossibility. This course came as a whiff of fresh air. 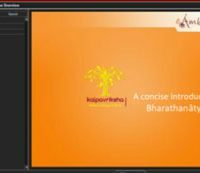 Looking up the various options on the eAmbalam’s learning portal in the eAmbalam site, I chose to enroll into the ‘Concise introduction to Bharathanātyam’ a 6 month certificate course. The secure payment gateway helped fee payment after filling up the enrollment form. What attracted me to the course was the convenience of it. One can learn from anywhere anytime. My travel plans did not hinder my learning. Access to my teacher sessions kept the continuity on. The e-learning platform enabled my assignment submission and interactions with course mates. Since the focus of the course is without compromise on tradition, though online, my learning was not disturbed. One can record oneself and submit it for review. The ‘Meet Your Teacher’ sessions are arranged periodically. In these one can clarify doubts and receive related guidance from the assigned faculty. In as many as 24 sessions the topics were covered exhaustively. As a student we are entitled to access the archive of classes also. We can see our grades, send and receive messages from teachers and schedule classes with prior discussion.The support system for the content is in the form of an exhaustive glossary, a phonetic chart to assist pronunciation and also audio downloads for practice. If it has to be pointed out as to what is unique about learning Bharatanatyam at eAmbalam’s Kalpavriksha, it is the integrated fitness module. In dance, the student needs to learn a module of fitness and yoga in the beginning of the program. One becomes a fit dancer! Also for those who are in various stages of learning there is the exclusive 16 week Yoga for Dancers course to benefit from. Once we pay up for the course, the support team takes over confirming the payment transaction and giving access to the learning portal. We are at first given a username and password. The technical team explains the technical aspects. The teacher does the Course orientation and the self study material of the chosen course can be viewed. As we do the self study we can watch the videos, take up assignments at the end of every chapter and download study materials in the form of PDFs. 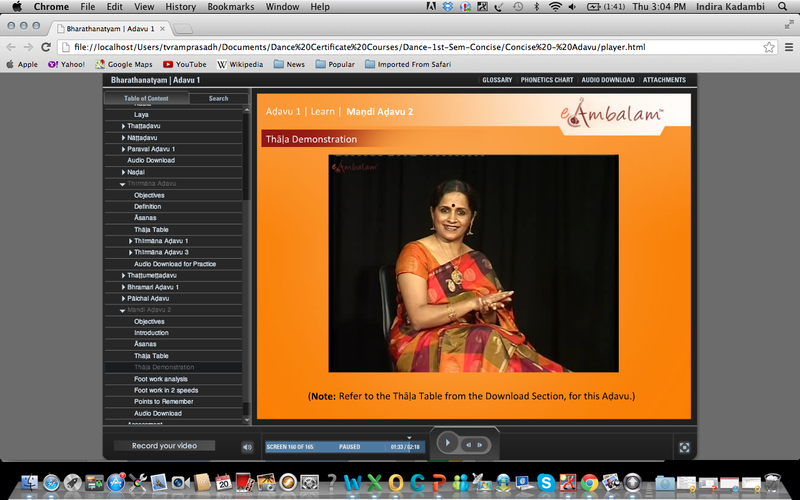 It is interesting to note that related subjects like Carnatic vocal as well as Nattuvangam classes are available in a one to one web conferencing mode as in Skype in a special section called One to One Virtual Classes. There are certified courses and courses which a student can take for art’s sake – without certification. Also the student can participate in forums, create one’s own blog, write an article for the community portal and keep in touch with eAmbalam news.